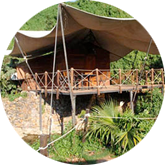 Hotel Ravine is a beautiful 3 Star hotel that is nested in year-long greenery. The only certified 3 Star Hotel in Panchgani, it is the ideal getaway from the hustle & bustle of the big city. A stay at Ravine offers the perfect combination of scenic beauty, tranquility, exquisite hospitality and a luxury hotel experience. 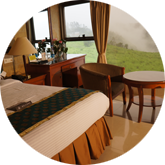 The best part about being at Ravine is comfort, luxury, service and a breathtaking view of the lush green valley. 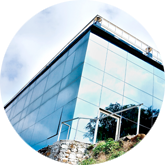 If you are looking for luxury hotels in Mahabaleshwar or Panchgani, Ravine is the place to be. Looking over a breath-taking panoramic view of the lush green valley in a soothing ambience, the multi-cuisine restaurant at Ravine named 'The Melting Pot' offers a choice of scrumptious Veg. & Non-Veg. 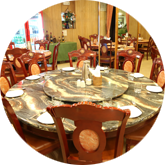 cuisines that are sure to tickle your taste buds. Ravine is one of the best hotels with conference facilities. We have a large conference hall where organizations or companies can arrange conferences or workshops. The hall seats 80 persons and is fully equipped with modern conferencing facilities & equipment, including a projector. There is a smaller conference room that seats 40 persons, and is also fully equipped with all conference facilities and equipment. Also, we are the only hotel in the area that provides wireless internet access and printing, using the latest technology on Wi-Fi 802.11b network. 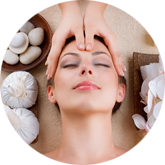 Guests can enjoy an incredible spa experience that offers Ayurvedic massage, aromatherapy, body scrubs, wraps, and massage, reflexology and other special treatments. 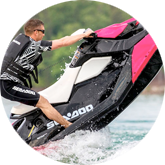 For all you adventure buffs, you will find adventure sports like Paragliding, Jet Skiing and Kite Surfing in some of the most beautiful locations. At Ravine we offer a fantastic mix of standard, superior and executive rooms. The rooms are spacious and immaculately fitted with state-of-the-art amenities, elegant furnishing, comfortable beds, quality tile work and perfectly designed bathrooms, for a fantastic living experience. In all rooms you will find comfortable spring double beds, clean linen, clean & well-equipped bathrooms, AC, telephone, flat screen TV, and Wi-Fi connectivity. Some rooms also include a sofa, bath tub, small fridge and a tea & coffee maker. If you want to go rustic without letting go of your cell phones and televisions, we have just the thing for you, with Ravine's outdoor camping options. Our luxurious tents come fully equipped with T.Vs and telephones. Overlooking the scenic valley, the tent area is beautifully landscaped and offers a Koi fish pond, waterfall, private white sand beach, salt-water pool, and garden. 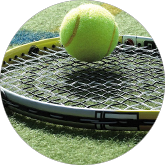 Ravine Hotel is the only place to play tennis in the hills of Panchgani and Mahableshwar. With 4 Official size Tennis courts, and a full time tennis coach, Ravine Hotel boasts of State of the art Ball Machines, and Courts that offer a breathtaking view over - looking the valley. 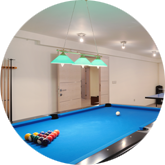 We have a game room with pool tables, carom, table tennis, and other games to enjoy. 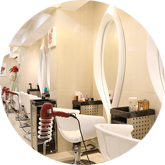 Get yourself groomed and get the latest hair styles at our salon. 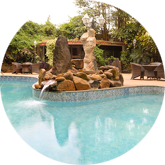 Take a dip, cool off and refresh yourself in our outdoor swimming pool. 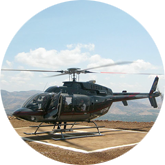 Guests can cut down on travel time by using the helipad service offered at Ravine - the perfect option for the guest in a hurry! With all these services available, it's no wonder that guests feel pampered and cherished at Hotel Ravine!